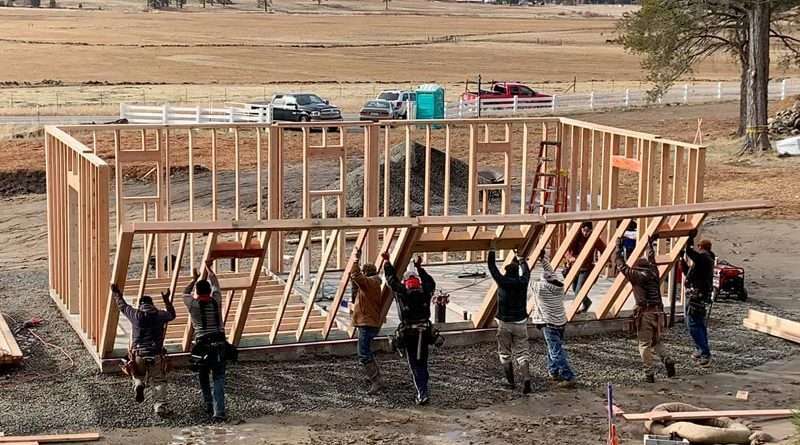 The wall frames are going up. Lumber was donated by Sierra Pacific Industries in Quincy. 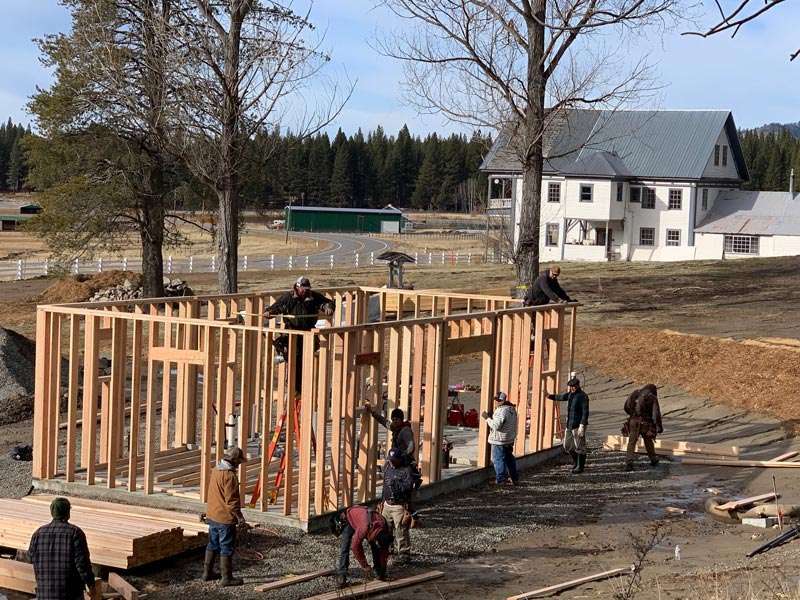 On the two freezing days after Christmas, business members and Mohawk Valley Stewardship Council (MVSC) volunteers began construction of the new bathhouse at the White Sulphur Springs Ranch in Clio. The bathhouse is part of an overall restoration effort at the ranch and a major component of the planned community swimming facility that will accommodate all users, including children and the disabled. Businesses from Redding, Reno, Quincy and Clio all contributed the necessary building materials and labor to raise the new bathhouse. General Contractor Taylor Carr, owner of Artifex Homes in Clio, provided the construction crew. Dave Little with Sierra Pacific Industries in Quincy donated the framing lumber and SPI Redding Division provided the windows. 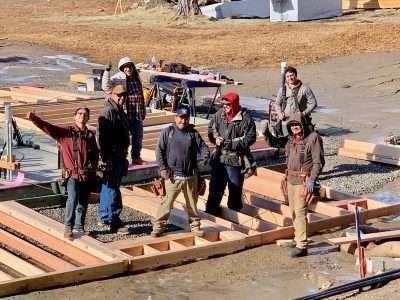 Andrew Cross, general manager of the Truckee-Tahoe Lumber Company in Truckee supplied all the paneling, roof sheathing and hardware. MVSC depends on the generosity of community businesses and individuals to achieve the goal of renovation of the historic site in Mohawk Valley. Businesses as far away as Reno also helped. Western Nevada Supply, Reno Truss, DHC Supplies and Titan Construction Supply were all major contributors. The complete list of companies that contributed to the project is provided in this issue of the paper. Things are happening that locals and visitors alike can see from Highway 89 in the Mohawk Valley. If interested in becoming a member of MVSC, visit www.whitesulphurspringsranch.com. The partially completed bathhouse is ready for roofing and siding.